Right Mate – Let’s Play Futbol! 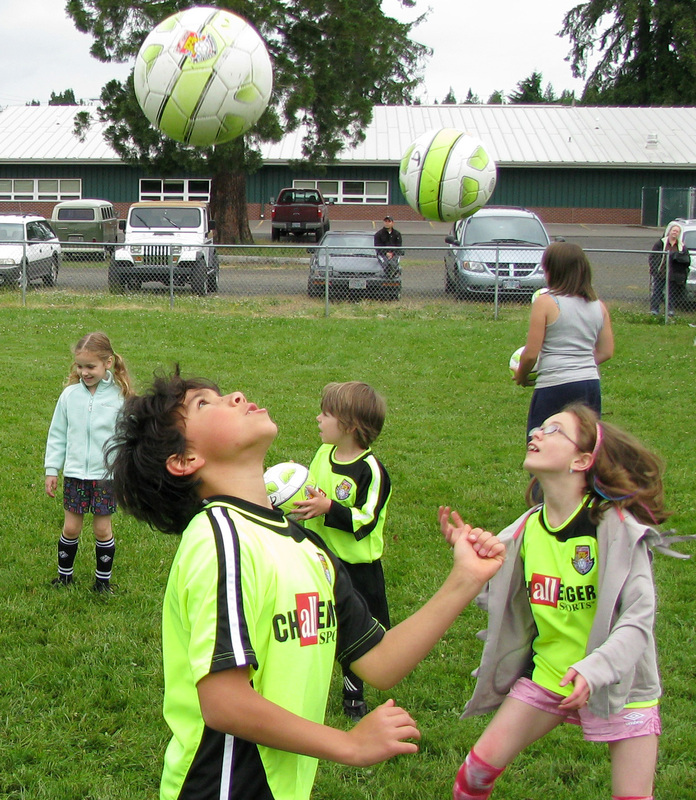 Those were some of the strange phrases heard on the Vernonia school field a few weeks ago, as the Vernonia Soccer Club (VSC) spent a week training with Jack Walsh and Tim Drohan. Walsh and Drohan are two young gents from England who spent the week schooling Vernonia youth in soccer skills, training drills and soccer (or as they like to call it, futbol) culture. It was all part of the Challenger Soccer Camp hosted by VSC. Challenger Soccer Camps provide a British style, day camp experience that teaches young soccer players new skills and builds confidence, while having fun at the same time. 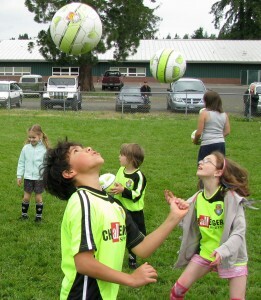 In Vernonia, about twenty-five players ranging in age from four to twelve participated. Not only did the students learn discipline and how to dribble, trap, shoot and head the ball, they also learned about the English Premiership (the top league in England), Major League Soccer (the top league in the United States) and about some of the most famous soccer players in the world. And they learned lots of British slang and soccer terms along the way. The puzzled looks from the kids when they were first told to get on the “pitch” or tuck in their “kit” were priceless, but they sure caught on quickly, especially when they had to run around the “grid” or do pushups when they didn’t hustle or were caught fooling around. By the end of the week, four year olds were sprinting across the “pitch” to avoid punishment. Don’t get the wrong idea; this was not like boot camp. A little discipline seemed to work for the kids and the players really seemed to enjoy their time with their new English friends. Besides using games to teach skills, and scrimmages for practice, the coaches gave many of the kids nicknames and played elimination trivia games to teach them more about the world of soccer. At the end of camp, each player received an individual evaluation from Coach Jack and Coach Tim. One of the young girls was having trouble reading the handwriting on her evaluation and asked Tim to read it to her. Another girl stood in line behind her. “Can you read mine too, please,” she asked after Tim read the first card. “I know what you wrote; I just want to hear you say it.” she said. After working with the kids, Walsh and Drohan held a two hour Coaches Clinic on the last day of camp for adults who want to coach Vernonia youth. “We’ll teach them basic warm ups, basic drills—footwork, positional play–so they can improve the kids,” says Walsh. It’s a great trade off. For the young English coaches, the Challenger camps are a fun way to spend the summer, traveling the United States and teaching American kids about the game of soccer. Hope to see you on the pitch this summer!